Former World Champion Viswanathan Anand maintained a full point lead in the FIDE World Candidates Tournament after playing a draw with Shakhriyar Mamedyarov in round 10. Anand’s nearest rival Levon Aronian also made a draw, with white against Veselin Topalov. In the all-Russian matches Peter Svidler defeated Vladimir Kramnik, while Sergey Karjakin and Dmitry Andreikin drew. Anand is clear first with 6,5 points, one point ahead of the second-placed Aronian. Mamedyarov, Karjakin and Svidler are on 5 points each, while Kramnik and Andreikin share the 6th place with 4,5 points. Topalov remains last with 4 points. The 6.h3 Naidorf Sicilian is all rage now in the FIDE World Candidates Tournament. 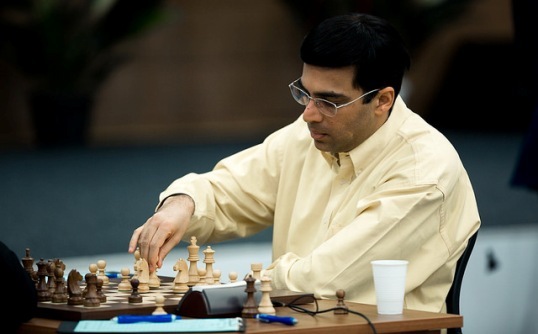 In round 10 Viswanathan Anand again used the system, this time in the game against Shakhriyar Mamedyarov. The game was similar to Anand’s match against Topalov, but this time black was more vigorous to trade the pieces, counter in the center and achieve good play. Anand made a good psychological decision to go for relatively simple position in which Mamedyarov, a gifted tactician, could not create threats with taking excessive risk. At some point white offered moves repetition but black decided to play on. However, on move 30 black changed his mind and offered a draw. Dmitry Andreikin defended with the Taimanov Sicilian and Sergey Karjakin used Nepomniachtchi’s favorite 7.Qd3. Incidentally, Ian Nepomniachtchi was commenting the games live for Russian audience. Karjakin followed his earlier clash with Mamedyarov (2009), but then he chose a different pawn structure with 13.e5, very similar to the Classical French. Black didn’t meet many obstacles in solving the typical problems – exchange of the light-squared bishops and counterplay on the b-file. Having achieved no advantage, white conceded a draw by repeating the moves. Peter Svidler had another go at the Dutch defence and Vladimir Kramnik responded with the customary expansion in the center. With the slightly better pawn structure white claimed a small advantage, but black always remained solid and was close to trading off the entire queenside. 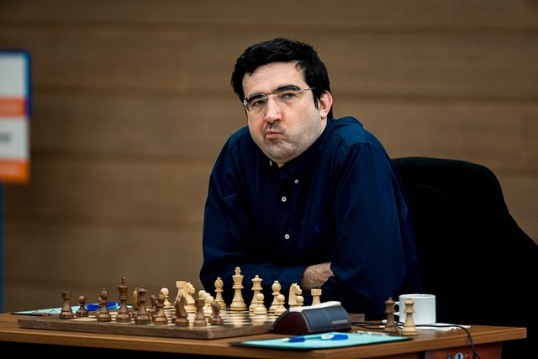 At one point Kramnik blundered horribly by allowing 32…Bxh2+ which lost him an exchange and a pawn. Further, the white king was exposed to a relentless attack and he gave up shortly before the time control. Levon Aronian chose a quiet setup against Veselin Topalov’s Chebanenko Slav, allowing black to extinguish much of the opening pressure. Around move 14 white was uncertain how to place the pieces. At the press conference Topalov proposed 15.a4 Qb6 16.Bc3, but Aronian replied that he didn’t like the bishop there. After black installed the knight on the strong d4-outpost, white understood that he should be careful not to end up worse. Topalov thought that he had small advantage throughout the middlegame, but he decided not to be rash and make mistakes in pursuit of a victory at all costs, as it happened to him earlier in the tournament. Despite the doubled f-pawns and opponent’s passer on d-file, white was able to hold the endgame. Draw signed on move 45.